The club was formed in the early 1990s as a non-profit organization. All profits are donated back into surrounding communities. The club is able to donate back money through area Junior League team sponsorships, and donations to benefit organizations. Each year the club gives a scholarship to a high school senior at Jay County High School in nearby Portland. The recipient must be in good academic standing, and planning to study in an automotive-related field. Thousands of dollars have been given back to the community through this scholarship. The club is open to all makes, models, and years of cars and trucks. For several years, the club was a chapter of the Late Great Chevy Association of Orlando, Florida. That association was bought in early 2006. As a result, the club is now a chapter of Eckler’s Classic Chevy International of Florida. The Crown City Cruisers car club was founded by a group of nine close friends who worked together at the now-closed Indiana Glass factory in Dunkirk. 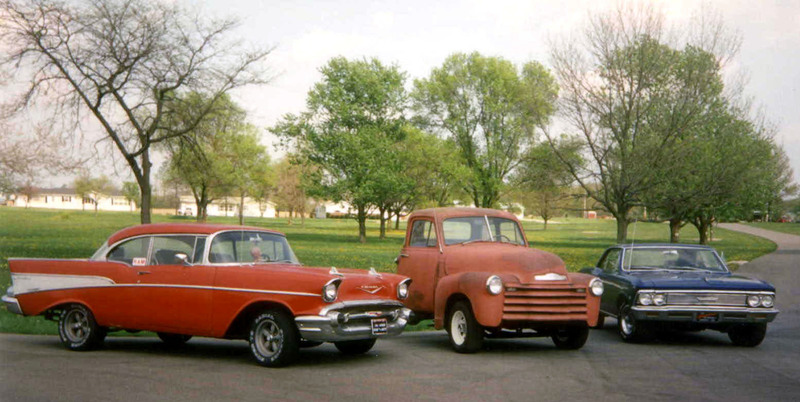 The group enjoyed working on classic cars and attending car shows together years before the club was formed. Two years before the club was formed, the group hosted its first car show in the Dunkirk City Park, a show that continues today. The success from the first two shows in the park inspired the members to form an official club in 1993. The idea to form the club is credited to current President Max Weaver. What started as a small group of close friends has grown into a large family of car enthusiasts. In 2007, the club reached an all-time high of 70 members, the most members the club has ever had at one time. Besides the Dunkirk City Park show, the club started hosting cruise-in events in the 1990s at the Albany Hardee’s. The restaurant was eventually converted into a McDonald’s, and the club continues to host cruise-in events at the restaurant. We encourage our members to participate in the governing of the club. Each March we hold an election for club officer positions including: President, Vice President, Secretary, Assistant Secretary, Treasurer, and Historian. Our current officers are featured on our club officer page. Our meetings are typically held on the last Thursday of every month at 6:30 p.m. inside of the Local 501T Union Hall in downtown Dunkirk, Indiana. Each month our meeting time and location is posted in red in the “Upcoming events” area on the home page. The Union Hall is located in the heart of downtown Dunkirk on Indiana State Road 167 (known as Main Street in Dunkirk). If you are interested in joining the Crown City Cruisers car club, please download a membership application. Next, mail the completed application with a check for $25.00 to the address on the application.